And in that instant, by secularizing the sacred, Ray Charles ripped up the rule book and created a new religion…soul music! In ancient times, the gospel traveled by foot as apostles walked from town to town spreading the good news. This time around, it was shipped and flown across the world courtesy of Uncle Sam. Military servicemen stationed at international bases often brought records with them that found their way into the hands of the young hipsters of their host countries. Port cities around the world were renowned for the amazing American records that could be found. These records set fire to the imaginations of local musicians and bands were formed in response. In some instances, the servicemen, soul apostles, formed bands themselves and presented a closer approximation of the records the locals loved. Some of these gained a certain amount of success and notoriety in those countries. A great examples of this is The Airedales; fronted by Rocky Roberts and later, Wess Johnson. Founded in the U.S. by Doug Fowlkes, Rocky Roberts soon took over front man duties for the Airedales. Military service beckoned and Rocky Roberts was sent overseas to Italy. There, he continued with a reconstituted version of the Airedales. 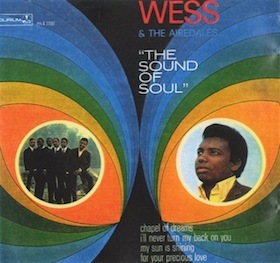 In 1967, American born Italian bassist Wess Johnson acceded to lead spot. With Rocky Roberts, Wess Johnson, and a band made of Italians and Americans, the Airedales created a soul/funk sound as moving and authentic as anything coming from the United States. Their stage show also kept pace with their stateside inspirations. Just check out this clip of the Roberts fronted Airedales. Musically, they were as tight as James Brown & the Famous Flames. Performance-wise, they exuded the same energy and showmanship. As with all bands of the time, foreign & domestic, covers featured prominently in The Airedales’ sets and became showcases for their skill and arrangement prowess. One of the last covers they performed with Rocky Roberts was a version of “Hey Joe.” By 1970, they had developed past their earlier R&B sound and into serious funk. Check their second recording of “Hey Joe,” now with Wess at the helm. The Airedales eventually disbanded. Wess partnered with Italian singer Dori Ghezzi to record a string of pop singles with some success. However, it is the era of the Airedales that does it for me. These musical heralds helped lay the foundation for the international soul scene that still thrives to this day and proved that no matter where you go, soul is truly an international language.